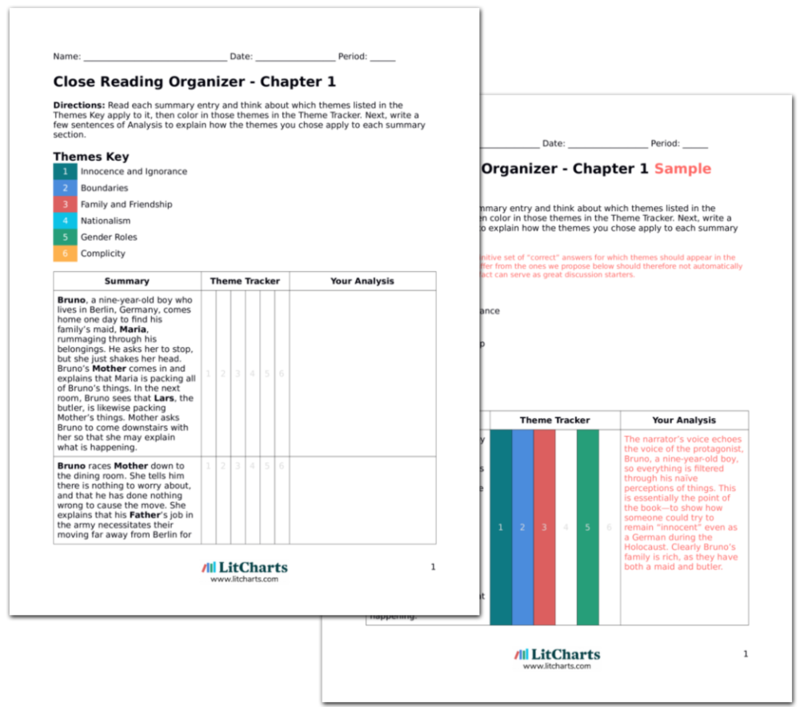 Instant downloads of all 946 LitChart PDFs (including The Boy in the Striped Pajamas). LitCharts assigns a color and icon to each theme in The Boy in the Striped Pajamas, which you can use to track the themes throughout the work. Bruno is never heard from again. Soldiers search every part of the house and the village, and his clothes are found at the fence, but it seems as if he has vanished off the face of the earth. Mother stays in Out-With for some time, hoping Bruno will turn up. When she does return to Berlin, Gretel notices that Mother spends most of her time crying, and Gretel, too, misses Bruno very much. Father stays at Out-With for a year, but orders around the soldiers mercilessly and becomes very disliked. Bruno dies anonymously, along with the other victims of the concentration camp. As these victims’ bodies were either left in mass graves or burned, and Bruno was wearing the “striped pajamas” of the other prisoners, his body is never identified as different from the rest. This is another metaphor for how, despite all the Nazi’s anti-Semitic rhetoric, there is truly no difference between human lives, regardless of race or religion. Strangely, Boyne’s narrator continues to speak as if through Bruno’s perspective even after Bruno’s death—Auschwitz is still “Out-With,” and Mother and Father are still referred to as such. The narrator continues in Bruno’s voice of purposeful innocence and naiveté, so the “different” soldiers are never specifically named as the Allies. All of Boyne’s vague language regarding the Holocaust is an attempt to make his fable universal, and this point is especially emphasized in the bitingly ironic last lines of the book—ironic, of course, because atrocities are taking place at any given time somewhere in the world, and people seem to have learned few real lessons from the Holocaust. Thus the lessons of this book—the dangers of nationalism, racism, sexism, complacency, and ignorance—are meant to be applied to present situations, so as to keep history from repeating itself. Within the narrative itself, we are given few details of the nature of Father’s moment of realization—it’s unclear if Bruno’s death made Father realize that his thousands of other victims were valuable humans as well, or if he was simply overcome with emotion and essentially lost his sanity. Father’s punishment is never stated in the book, but he was likely tried at the Nuremberg trials and sentenced to death for his war crimes. Munk, Olivia. "The Boy in the Striped Pajamas Chapter 20." LitCharts. LitCharts LLC, 20 Jan 2016. Web. 25 Apr 2019. Munk, Olivia. "The Boy in the Striped Pajamas Chapter 20." LitCharts LLC, January 20, 2016. Retrieved April 25, 2019. https://www.litcharts.com/lit/the-boy-in-the-striped-pajamas/chapter-20.